Golden Veroleum Liberia's industrial-scale palm oil plantations have a devastating impact on people and the environment. Since arriving in Liberia in 2010 it has developed a consistent record of land degradation, human rights violations and disregard for community land rights. 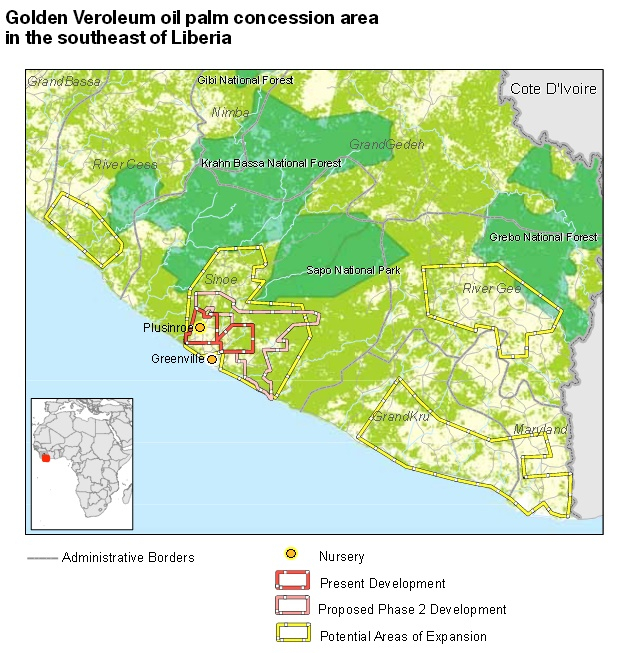 Golden Veroleum Liberia GVL) is Liberia's largest palm oil company. GVL started its operations in Liberia in 2010, when it was granted a 65 year concession by the Liberian government. GVL's contract with the government allows it to convert 2,600 kilometer of land into palm oil estate. The company is backed by the world second largest palm oil producer, Golden Agri-Resources (GAR), based in Singapore. Lenders should cut their financial ties with GAR and provide no new financing to GAR, GVL or any of their business partners found to be connected to land grabs, deforestation and related human rights violations. Golden Veroleum is owned by the U.S.-based Verdant Fund LP, whose sole investor is Singapore-listed palm oil giant Golden Agri-Resources, the world's second-largest palm oil plantation company. Testimonies form GVL’s workers, collected in the 2018 report High Risks in the Rainforest by Sustainable Development Institute and Milieudefensie point out that GVL’s safety practices are insufficient. GVL does not provided decent safety equipment or adequate on-site job training. Workers are transported in overcrowded trucks or tractors, sometimes transporting up to 200 people at once. GVL’s workers are often underpaid. When failing to meet certain quotas, workers are docked salary, meaning they can receive only half the legal minimum wage. GVL is clearing forest that is has identified as High Carbon Stock (HCS) forest and High Conservation Value (HCV) areas. According to the the ‘High Risks in the Rainforest’ report, GVL cleared 380 hectares of HCS forest patches and 320 hectares of HCV areas between 2015 and April 2018. These patches include 268 hectares of high priority protection forests that are prohibited from clearing. Liberia has high levels of biodiversity and is home for several endangered species including the pygmy hippopotamus and western chimpanzees. Previous studies, including GVL’s 2014 HCV assessment show the presence of these endangered species in GVL’s areas of interest. While the Tartwe-Kabaa-Nitrian areas was previously considered a chimpanzee habitat, community members have reported that both the pygmy hippopotamus and chimpanzees have moved to other areas since GVL started to clear forest. Field surveys by Sustainable Development Initiative and Milieudefensie show that GVL’s forest clearance has included several cases of destruction of riparian buffer zones. This can result in the pollution of drinking water due to erosion and chemicals used on the plantation, as well as drying out of streams and loss of aquatic biodiversity. These activities violate RSPO Principles and Criteria, as well as the policies of both GVL and GAR. An assessment of the impacts of 2016 by Sync Consultants Limited presented evidence of pollution of drinking water sources by GVL. GVL promised to replace the contaminated sources but failed to do so. GVL promised to replace these sources it fails to do so or the provided water resources are not functioning or not adequate to serve all community members it should be serving. GVL’s approach of engaging with communities often comes down to signing a Memorandum of Understanding (MoU). As the Forest People Programme (FPP) reports these MoUs are generally not freely signed by communities since GVL’s employees, agents and or/local governments influence the process through intimidation and threats to community members. In addition, communities are not well informed about the scale and exact location of GVL’s projects, or about their legal rights, and independent legal assistance is often lacking. In addition, FPP reports that GVL does not provide the minimum crop compensation set by the Minister of Agriculture and engages with communities using a ‘take it or leave it’ approach. A February 2018 decision by the Roundtable on Sustainable Palm Oil (RSPO) confirmed a series of ongoing violations by GVL, including failure to implement adequate free, prior and informed consent (FPIC) procedures, destruction of sacred sites, coercion and intimidation of community members to sign agreements with the company, and continued development of disputed land. The RSPO Complaints Panel ordered GVL to cease operations in multiple locations in its concession area. GVL has rejected the 2018 RSPO ruling and appealed the Complaints Panel decision. On July 13, 2018, the RSPO rejected GVL’s appeal stating it had no merit. In July 2018 GVL announced it was voluntarily suspending its membership of the RSPO. GVL has granted its concession for 65 years without a competitive bidding process. According to the Liberian Extractive Industries Transparency Initiative (LEITI) and auditing firm Moore Stephens, this is in violation with the Liberian Public Lands Law. This law states that concessions can be granted for no longer than 50 years and competitive bidding processes are legally required. The Liberian tax codes says that stability clause for income tax should not exceed 15 years. However, the agreement between the Liberian government and GVL provides a stability clause of 40 years. In addition, the agreement allows GVL to withholdtax payments for up to 65 years. GVL is a subsidiary of the Verdant Fund LP, a private equity fund, of which Golden Agri-Resources (GAR) is the only investor. Corporate loans for GAR and shares in GAR are therefore included in this finance overview. DBS Nominees PTE Ltd, DSBN Services PTE Ltd and DBS Vickers Securities hold together 19.26% of GAR's shares. GVL’s Chemicals Causing ‘Miscarriages among Women’ in Grand Kru County? Should Liberia develop a legal framework on Industrial Agriculture? Going out, but going green?